It’s no secret that holistic healthcare is gaining more and more attention. As speech language pathologists, we are highly in tune with the clinical needs of our clients, but is there a way to go beyond a traditional therapy approach? Speech language pathologist and holistic health coach Kaitlyn Lokey does just that. In this interview, Kaitlyn describes her holistic approach to therapy, including the use of reflex integration, and the positive effects it has had on her patients. First, tell us a little about yourself! Where did you go to school, what is your title, and where do you currently practice? I went to Loyola University in Maryland for both my undergraduate and graduate degrees. I am a speech-language pathologist, holistic health coach, and MNRI Core in Training Level 4. Right now I work in South Jersey. Please describe your current setting and therapy caseload for our readers. Currently I am working in an occupational therapists’ office. I also see clients privately in an office space or in their homes. The majority of my caseload is children with Autism Spectrum Disorders. I also have some clients with genetic disorders, articulation disorders, and language disorders. Their ages range from 2 to 19. What is MNRI, and can you describe the research behind the practice? MNRI stands for Masgutova Neurosensorimotor Reflex Integration. It is a method developed by Dr. Svetlana Masgutova to integrate primary motor reflexes, tactile integration, oral facial reflex integration, visual and auditory reflex integration, and stress hormone release. I first learned about the Babkin Palmomental,Moro Startle, and Babinski reflexes during my college years at Loyola University. We learned that these reflexes only exist in babies. The presence of these reflexes in older children or adults can be a sign of neurological damage. When you take an MNRI course, you learn that these reflexes are actually the beginning of our motor movements and integrate into high cognitive functions. If any trauma occurs, whether it is in utero, during birth, or anytime after (ex. 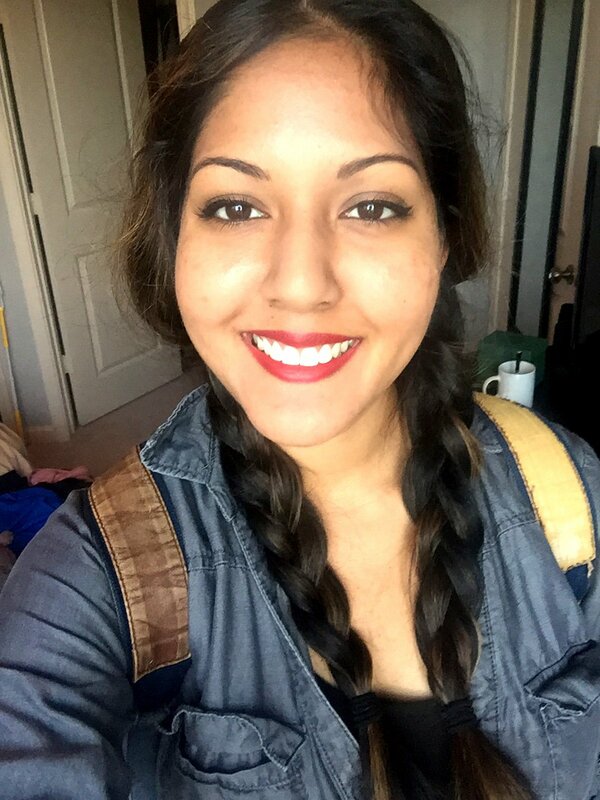 car accident, PTSD, anxiety, depression etc. ), some reflexes may not be integrated properly. Our reflex patterns stay in our bodies until they are needed for protection. For example, when we fall, our arms instinctively reach our to protect us. Through extensive research and experience, Dr. Masgutova found that certain reflexes effect different parts of our cognitive abilities. If our Babkin Palmomental reflex is not integrated, it can impact feeding, speech, language, and articulation. Through this work, I am able to provide the foundation for speech and language development, while showing the body it is safe and able to learn and experience the world. How did you find out about MNRI? MNRI is called the "missing link" because it gives the body the ability to accomplish tasks it may have been using compensations to do previously (or wasn't able to do at all). Since most other treatments focus on higher cognitive skills, MNRI provides the underlying skills necessary to achieve these higher cognitive functions. For example, the “Hands Supporting Reflex” is how you prevent yourself from getting seriously injured when you fall. When you start to fall, your arms extend and your hands open to catch you on the ground so you don't hit your face or head. If this reflex isn't working properly, you will fall on your face and your body won't feel safe. Through extensive research, they have found that this reflex also helps with higher cognitive functions like personal space, self-confidence, and self advocacy. Children who don't have this reflex may bully other children or become a victim of bullying. If we are trying to get a child to understand personal space, but who do not have this reflex, it will be something they always have to be aware of. If we can integrate the child’s Hands Supporting Reflex through MNRI, the child will be able to understand personal space of others because they are now aware of their own body and personal space. Integrating a reflex is using MNRI techniques to teach the body the movement pattern of the reflex when given the sensory stimulus. By showing the body how this works, we are showing the body how it can be safe, and how to use this movement in a time of danger. We repeat the reflex sensory stimulus and motor response many times. I will often teach parents how to do a particular sensory stimulus at home so that the child's body can get as much practice as possible. For some people, when you do the sensory stimulus, you may see a movement in the body. The person may even feel an emotional response. After doing reflex re-patterning exercises (sensory stimulus and motor pattern), we want to see that response decrease. After age 3.5, all reflexes should be integrated, and there shouldn't be a response to the sensory stimulus. We will be able to tell if the reflex is integrated if there is no longer a response to the sensory stimulus and if there is improvement in other areas of function. For example, you would expect a child to be able to feed him or herself after the Babkin reflex has been integrated. There are other approaches aside from MNRI that inhibit the reflex, which means they are preventing the body from responding to the sensory stimulus. Dr. Masgutova has found that we do not want to inhibit these responses because they provide the foundation for higher cognitive functions. Take the Babkin reflex as an example: if we are unable to feed ourselves, we do not have the ability to survive. If our body doesn't feel it has the ability for survival, it will not provide the ability to speak. Speech is our highest cognitive function, and therefore it requires a solid foundation. Can you give example of an exercise to improve a reflex? The way MNRI approaches reflex integration is by working with the sensory stimulus and the motor response. Think about when you were younger and the doctor hit below your knee. The correct response, or what your doctor was looking for, was that your leg kicks out.While we don't work with this particular reflex (Philipson's Reflex) because it is a spinal reflex and doesn't reach the brain, it shows you how there was a sensory stimulus and a motor response. In order to elicit the Babkin Palmomental Reflex, you push into the center of the palm. For a baby, you want to see their head turn to the side of the hand you pushed on and their mouth to open. This reflex is how the baby learns how to eat and later on, how to speak. We integrate this reflex by using the sensory stimulus on the palm and then teaching the correct motor response of opening the hand and opening the mouth. There is a specific amount of time to hold the sensory stimulus to allow the brain to respond and a specific number of repetitions to do the motor response. We want the brain to recognize the movement and repeat the movement over and over so the pathway can fully myelinate and become automatic. Even if the child never had this reflex due to trauma in utero or a genetic disorder, the body will recognize it because it is part our DNA. Who can perform MNRI? Do you need special training or certification? Anyone can take MNRI courses. However, in order to become a Core Specialist, you must have taken prerequisite anatomy courses. This is because MNRI is body work and requires an understanding of human anatomy. Therefore, most class participants or Core Specialists are speech language pathologists, occupational therapists, and physical therapists. In order to become a Core Specialist, you are required to take 12 courses, four intensive training courses with testing, 64 hours at what’s called the “Family Conferences,” and finally, complete four final tests! I only have the four final tests remaining, but this has been a 4 year process to get to this point. A benefit is that once you take a course, you can start using what you have learned in therapy even before you are a Core Specialist. You don’t hear of too many SLPs trained in MNRI. What motivated you to pursue this path of expertise? Actually, I’ve been meeting a lot more SLPs at my trainings, especially at the oral facial reflex integration courses. It’s always exciting to meet other SLPs who are going through the training and have a similar holistic approach. I was beginning to see a lot of the traditional speech therapy methods as very cognitive and the children I was working with at the time in special education schools were not able to perform at that level. These children had severe Autism, genetic disorders, and cerebral palsy. Many were wheelchair bound, non-verbal, and engaged in negative behaviors. I was searching for a way to work with these children and to help them become as successful as possible. After taking my first MNRI course, I knew it was the right approach to do so. Unfortunately, it was difficult to do MNRI in a school setting, so working privately is what made the most sense in terms of service delivery for me at this time. Who is MNRI good for? Anyone can benefit from MNRI since most people have had some trauma in our lives — little or big. I’ve met people from all over the world who come to the family conferences for MNRI with diagnoses ranging from genetic disorders, Autism, and cerebral palsy, to PTSD, depression, learning disorders, and dyslexia. For speech-language pathologists, individuals with language disorders, articulation disorders, fluency disorders, feeding and swallowing disorders, apraxia, and dysarthria can benefit. Even individuals who experience difficultly with word retrieval, social situations, and executive functioning can benefit! 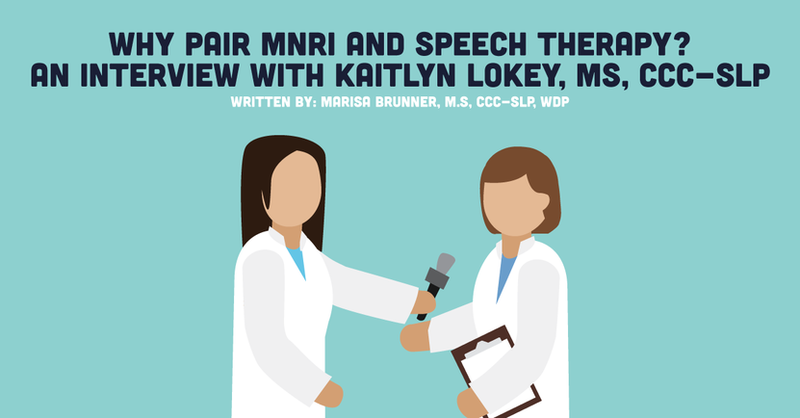 How do you currently incorporate MNRI into your daily clinical work as a SLP? I use MNRI with all of my clients. I have yet to work with a client that doesn’t need reflex integration work. Everyone has had some type of trauma in their life, whether physical or emotional, and reflexes are affected by trauma. When you start taking MNRI courses, you also see how many reflexes you need to work on yourself! You are also a certified holistic health coach. Can you define what that means for us? I go my certification at the end of my clinical fellowship year because I saw the food that was served in the school where I worked. It was terrible! I knew that this non-nutritive food had to have some impact on the children. Currently, I use the knowledge from my training and my continued research on nutrition to educate parents about the best foods for their children - and what to avoid when possible. All families are different, and some are more receptive to changing their diets than others. As such, my health coaching is always ongoing. How do you incorporate holistic methods into your therapy? When I evaluate my clients, I not only look at their language, communication, or articulation, I also assess their primary reflexes. If some of the reflexes are active, I incorporate reflex integration into their treatment plan. I also give parents a checklist of issues that may be a result of certain reflexes not integrating. The parental input gives me a good idea of how to work with the client. What do you find to be the most gratifying about employing such a multidimensional approach to therapy? Some changes take longer than others, but sometimes they can happen really fast! For example, I began seeing a particular client because he spoke very quickly. This client had a lot of jargon for a 3-year-old and needed to expand his length of utterances. He had previously received some more ‘traditional’ speech therapy where he sat at a table and practiced slowing down his speech to improve intelligibility. When I started with him, I incorporated reflexes and movement into our sessions. Within a couple months, his speech was 95-100% intelligible! Additionally, he didn’t feel the need to move around all the time, spoke in 5-7 word sentences independently, and all of his articulation errors were resolved. It was really exciting to hear feedback from his parents about how he is now able to tell them about his day, to answer questions, and to tell stories. It also shows how important it is to look at everything our clients are doing, and not just to focus strictly on speech and language. What is one challenge you have faced when including holistic methods into your practice? I think getting parents on board with changing the child’s diet is one of the most difficult challenges. Some of my clients have already changed their diets, and that is where I have seen the best results. It’s a lot of work for the parents to make diet changes within the family because it usually involves completely changing how they eat as well. I often suggest that the parents to try some recommended diet changes for at least a few months. They usually see positive changes, so then it is easier to promote follow-through. Would you encourage other SLPs to consider MNRI or other holistic approaches? Absolutely! Most MNRI courses offer CEUs for SLPs. Beyond that, it completely changes how you view your clients. As for nutrition, finding a good referral in your area for parents is a good idea. Reading articles and books on nutrition to provide a basic understanding on how nutrition affects the brain is also beneficial. How can other SLPs who are not currently trained become involved? Are there ways to safely include some holistic approaches into therapy sessions? The only way you can use MNRI is from taking a course. Once you take one course, you can start using what you’ve learned. What advice would you give SLPs who face pushback from clients or families that doubt the effectiveness of holistic methods? I like to direct my families to the MNRI website so that they can read scientific articles on studies using this approach. For nutrition information, I send families articles on the gut-brain connection, and how what we eat affects our brain. A book that I frequently recommend is Cure Your Child with Food by Kelly Dorfman. As an SLP, I know how important it is to abide by evidence based practice, and I want the families I work with to know that what I use is also evidence based. Can you share a resource with us for those who want to learn more about MNRI or health coaching? To learn more about MNRI, visit www.masgutovamethod.com. There, you can learn about the method, read scientific articles, locate courses near you, and read parent testimonials. For my health coaching certification, I went through the Institute for Integrative Nutrition’s online program. Thank you, Kaity, for your time and for sharing your expertise! It has been my pleasure! We're grateful to Kaity for sharing her expertise on MNRI! Do you take an “alternative” approach to traditional speech and language therapy? What holistic methods have you included in your therapy?